Sunday was one of those magical days – the kind of day that makes you forget that most of your “flying” over the past three months has involved walking up the hill after a minute long flight or shivering at the top waiting for it to become flyable. Once at Caburn, the car park was full and not a wing in the air. So I took some time to cook breakfast and slowly wandered up the hill. But then a couple of short flights helped remind me what a thermal felt like. So I was ready for when things started to pick up! What followed was two of the most amazing hours flying I’ve had! 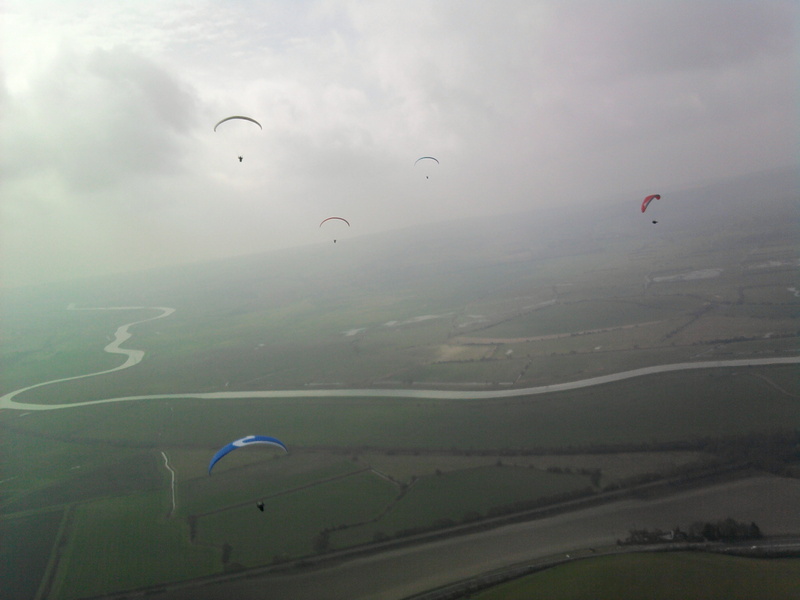 I chased the experienced pilots out over the road and the river. I braved the sinky air trusting that if they were going up ahead of me, then I would go up as well. And then when I lost all the height and thought I was going down, a bullet of a thermal walloped my wing, so I cranked myself into it and before I knew it, I was level with the top of the hill again! Today, I was pleased with what I did and learnt. I managed to take off several times in winds that would have scared me away a year ago. I was brave enough to leave the hill behind and not care if I couldn’t make it back. I followed others and didn’t run away just before finding the lift.